How One Telephone Call Could Save Your Company Money. It’s true. A single telephone call could mean that your company could increase profitability by cutting your costs. A significant portion of your operating costs is your electricity bill. A large proportion of that is your lighting costs. By installing energy efficient lighting you can benefit from lower operating costs immediately. So why delay, start saving now and call South London Electricians on 0208 406 9834 for a no-obligation chat about how your business could benefit from our industrial and commercial electrical services. 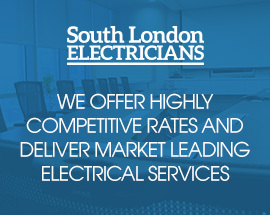 Why Use South London Electricians? Having worked with a number of big names on the high street, including the warehouse industry, factories, offices, and in smaller industrial units, you can be assured that our experienced industrial electricians can provide you with exactly the type of service that you may require. We also offer commercial electrical services for shops and supermarkets and we have carried out electrical installations for some well-known chains. So, if you need a commercial electrician for your business, we have the expertise and experience to cater for your exact needs. You benefit from an experienced, reliable, and competitively priced industrial electrical contractor with a fully qualified team of electricians. We are equally at home working on high amp three phase supplies or low current single phase installations. No matter how large or small your business is, we can discuss your particular requirements – from saving money on your electricity bill to upgrading an outdated electrical installation. We offer advice and free quotations for the work that you and your business need. We are fully up to date with the latest electrical wiring regulations that any business must adhere to. Poor electrical equipment and wiring not only potentially puts your employees at risk (Health and Safety at Work Act 1974), it can put you in a legal predicament should an accident happen because of it. We offer a 24 hour 7 days a week electrical emergency service so you are assured that should you encounter an electrical problem, it will be solved quickly and efficiently. Below are just some of the industrial electrical services that we can offer you. Many businesses are switching to using LED lighting because it saves money on energy bills. LED lighting can reduce your lighting costs by up 66% compared to conventional HID lighting. Good external lighting in a must for any industry, not only for safety reasons, but also to deter crime. We have a number of LED exterior lighting options for you, as well as security lighting. We offer electrical inspection testing services which will provide you with a full report of what work, if any may be required. If your premises are in need of a complete re-wire, or a partial upgrade, our team of electricians will ensure that the work will be completed in a set time scale and meet all current electrical regulations. You can ring us on 0208 406 9834 without any commitment whatsoever, and we can offer you the best advice based on your electrical requirements.